Texas 225 is the only Houston freeway that has sustained a major and permanent cancellation. The section of 225 inside loop 610, usually called the Harrisburg Freeway, was cancelled in the early 1970's. The rest of freeway was just finished in 2000, with the completion of the interchange and connection ramps at TX 146, leading to the impressive Fred Hartman cable stayed bridge. No further improvements are planned for 225 at this time. The 14-mile-long 225 corridor is an industrial delight, passing through a dense concentration of refineries, petrochemical plants, and tank farms. Depending on your perspective, it is either ugly or beautiful. Even today, a foul odor often lingers over the freeway. 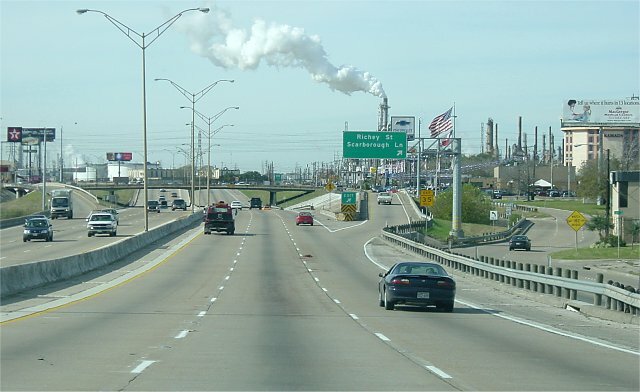 A Houston Chronicle news article published on August 9, 1999, provides more information on the history of the 225 corridor and the freeway cancellation inside loop 610. 1982 The Beltway 8 toll bridge is opened on May 6, 1982. It features a 1500 ft post-tensioned concrete box girder span. Late 80's A short section of freeway near Beltway 8 is constructed. 1995 The TX 146 cable stayed bridge is opened. 2000 The interchange and connection ramps at 146 are completed. TX 225 is complete. A. Looking west from the Battleground Road overpass. The Shell Deer Park refinery is in the background. Battleground road leads to the San Jacinto Battleground, where Texas forces under General Sam Houston defeated the Mexican Army under Santa Ana and won independence for Texas in 1836. Notice the palm tree landscaping. Any kind of landscaping on Houston freeways is unusual. B. Driver's view going west at the Richey Road exit in Pasedena. C. Driver's view of the tank farm just east of IH-610. D. The dramatic and permanent end of the LaPorte Freeway just inside interstate 10. The extension of the freeway to downtown Houston, known as the Harrisburg Freeway, was cancelled in the early-to-mid 1970's.